A Spanish judge has ordered two leaders of Catalonia’s pro-independence movement jailed while they are investigated on possible charges of sedition. 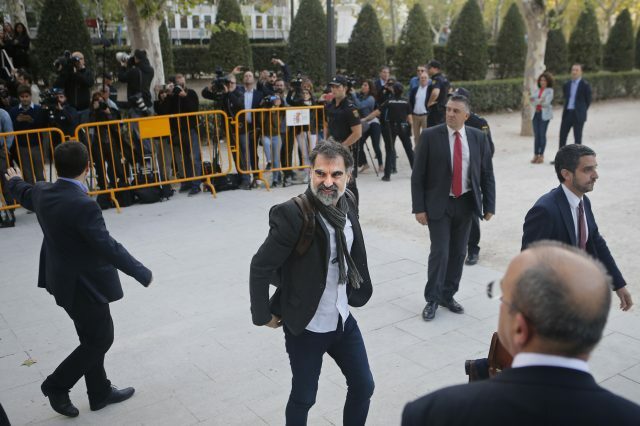 The judge jailed Jordi Sanchez of the Catalan National Assembly and Jordi Cuixart of the Omnium Cultural group after questioning them and two senior law enforcement officials. The National Court in Madrid is investigating the roles the four played during demonstrations in Barcelona on September 20-21. Spanish police arrested several Catalan officials and raided offices on those dates as part of the central government’s crackdown on preparations for an October 1 referendum on Catalan independence. Earlier on Monday, the judge ruled that Catalan regional police chief Major Josep Lluis Trapero and colleague Lieutenant Teresa Laplana could remain free under several conditions, including surrendering their passports and agreeing to appear in court every two weeks. The Catalan National Assembly and Omnium Cultural have called for people across Catalonia to halt work at noon on Tuesday to protest over the jailing of the two men. Both groups have been pivotal to the Catalan movement to secede from Spain and have drawn thousands of people to demonstrations in support of independence. Protests at the headquarters of the national government’s representatives in the Catalan provincial capitals are scheduled for Tuesday evening.